M U F F I N S ! ! ! You are about to see a batch of superlicious muffins. But don't take my word for it, try them yourself. The recipe comes from The Guardian Weekend magazine, 26th April 2008 issue, and is by artisan baker Dan Lepard. Begin by making the custard. In a large saucepan, put the cornflour, cocoa, brown sugar and cold water. Whisk together over a medium heat until boiling, very thick and smooth. Remove from the heat and beat in the butter and dark chocolate until both have melted and been absorbed. Add the oil, vanilla and one of the eggs - beat until combined. Add the remaining egg and the caster sugar and beat until the mixture is smooth and combined. In a mixing bowl, measure out the flour and baking powder and stir together. Sift this onto the custard and beat again until the flour is thoroughly combined. 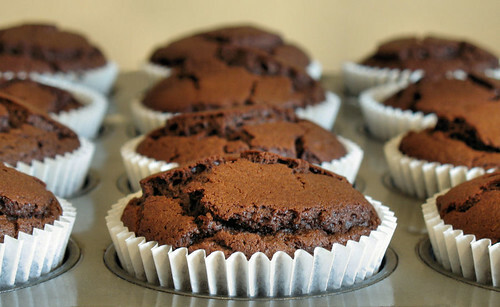 Spoon into 12 paper muffin cases that have been put into a muffin pan and bake for 25 minutes. You do not need any topping on these, they are rich, dark and sinful! The photo in this post is my entry for this month's 'Click', a monthly theme-based photography contest hosted by Jugalbandi. This month’s theme is: Crusts. After a dismal summer, our garden tomatoes are finally beginning to ripen. 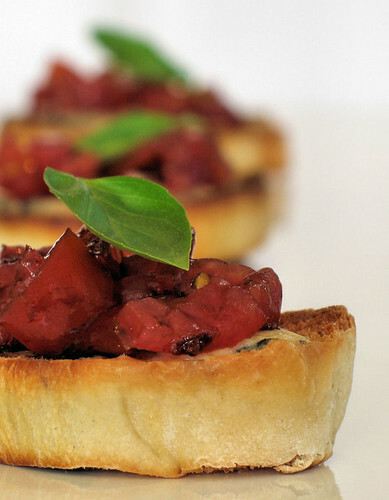 The cherry tomatoes are really sweet and just about perfect for this recipe. I've mentioned my love for party food before, and - as if I really needed an excuse - couldn't wait to make some bruschetta with the tomatoes. 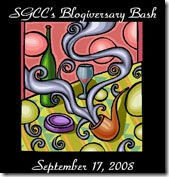 Susan, from Sticky, Gooey, Creamy, Chewy, is having a 'blogiversary bash'. Her food blog is turning one and I am going to the party. I can't wait to sample all the different dishes that have been cooked by food bloggers from around the world. Hope you are going to join in too! The recipe is easy, you can add different herbs to the tomatoes, and use your favourite cheese. Measurements are just a guide. Dice the tomatoes and place in a bowl. Add the herbs, chilli powder, sugar, balsamic vinegar and mix well. Season with salt and pepper and leave to marinate while grilling the bread. Grill the bread slices on each side until golden. Crumble the cheese over the grilled bread slices and grill until bubbling. Remove from the grill. Using a slotted spoon to drain the balsamic vinegar, put a spoonful of the tomato mixture on top of the grilled cheese. Pop a fresh basil leaf on top of the tomatoes and serve. Calling all passionate UK cooks! Are you a talented cook who is looking for that big break? Are you fiercely proud of your county and want to see it go all the way? Do you want to learn from some of the country’s finest chefs? If the answer to these three questions is yes – then read on! But it gets better, you will be mentored and masterclassed by one of the Nation’s finest celebrity chefs and your cookery skills will be pushed to their max. You will also be judged by some of the country’s fiercest critics so this show is not for the faint hearted! You can be an amateur or professional – but have one thing in common your talents in the kitchen could impress a celebrity chef. We will be filming the series from November 2008 to February 2009. If you are not the one then perhaps you might come into contact with just the sort of people we want to find! Please register your details on our phone line 09011 986 986 or email tastethenation@itv.com clearly stating your name, county and daytime contact number. You must be 16 years or older to apply. Calls cost 10p per call from BT landlines. Calls from other networks may be higher and from mobiles will be considerably more. Callers must be 16 or over. Lines close on Thursday 20th November 2008 at midday. Calls made after closing time won’t be counted, but may still be charged. We cannot guarantee that all applicants will be called back. Terms & conditions at itv.com/terms. On a recent trip to Cambridge, I had to be pushed out of a bookshop which was closing for the night. 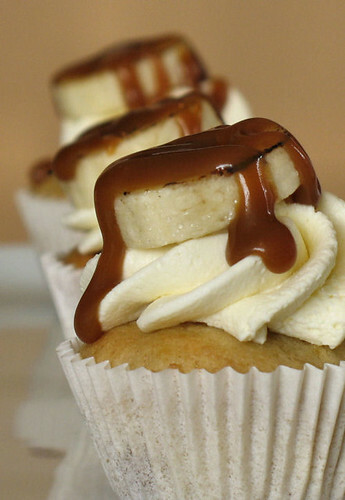 I had been thumbing through a cupcake book, when I glimpsed a recipe titled 'Banoffee Cupcakes'. I needed those cupcakes, like right now, and on getting home, (before you could say World Wide Web), had found the recipe. If you like sticky, gooey and creamy - these are for you! 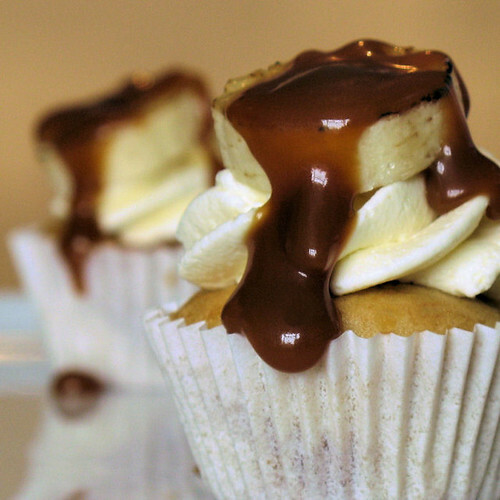 The sponge has moist banana, intermingled with chopped, chewy toffees - and the topping... drool... has freshly whipped cream and caramelised banana dribbling with dulce de leche. 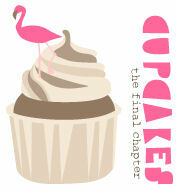 Gone are tasteless, dry cupcakes full of colouring, topped off with sickly buttercream. These cupcakes are modern, delicious and interesting! I made mini ones, just the right size for a slice of banana, which I caramelised - because my blowtorch doesn't see the light of day nearly enough. I also made a larger sized cupcake with plain banana slices. And you know what? I'm going to go back and buy that book! In a large bowl, beat the butter and sugar together until creamy. Beat in the egg and fold in the mashed banana. Sift the flour into the mixture and fold in. Gently fold in the chopped toffees. 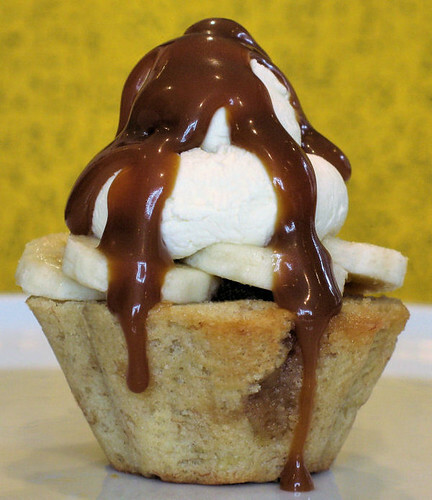 Spoon the mixture into well greased muffin tins, or tins lined with cupcake cases. Bake for about 16-18 minutes, until risen and springy to the touch. Mini cupcakes will take less time to cook, keep your eye on them. Remove from tins and cool on a wire rack. To decorate, pipe or spoon the whipped cream on the top of the cakes, top with slices of banana and drizzle with the dulce de leche. If caramelising the banana, sprinkle some caster sugar on the slices and melt the sugar with a blowtorch or a hot grill. Leave to cool before using - the sugar should be crispy. This is my submission for the September edition of Sugar High Friday, being hosted by Fanny at Foodbeam. She's calling for creative, exciting cupcakes and I hope she's going to love this one.